Apartments we’ve looked at so far? One. Apartments that were very pretty BUT were in a creepy and somewhat blighted part of town, tiny as hell, and with electric heat (effectively tacking on $100-200 a month for us)? One. It can only get better from here, right? I can’t live with that, people! If nothing else, I am a cranky old fusspot who needs doors closed, complete darkness and minimal noise to sleep at night. A curtain ain’t going to cut it here. Well, we still have a month, which is a long time, all things considered. And so, on with the search. I don’t blame you … I couldn’t, either! But I’ve seen people get very creative with folding screens. Then again, there weren’t kids and pets involved. I don’t mean to go there with any TMI detail but come on, dudes… parents’ bedroom right next to the kid’s bedroom? With just a folding screen between? I’m pretty sure that’s like, several years of therapy just begging to happen. Ditch the Van Houtens – they are dirty cheats IMHO – and build a Shoji screen? Check out Windsor Terrace near Park Slope. Cheaper than the Slope, but right on the park and close to the F train (if that works for you). We used to live there and there were lots of apt options. Good luck! Heh. Well, sadly, “cheaper than Park Slope” still ain’t all that cheap. We’re looking further into the interior of Brooklyn. http://bushwickbk.com is kinda making me love Bushwick (even though the place that was creepy was there). That is so strange. It looks less like an apartment and more a set design for dinner theater, the cast all running from room to room to figure out a murder or something. I love the economy of space, though. Is that a kitchenette or a galley kitchen? LOL—kind of what I was thinking!! -luck in finding something fantastic for you!!! Depending on the apartment, it could be either a galley kitchen or kitchenette depending on how much room there is. 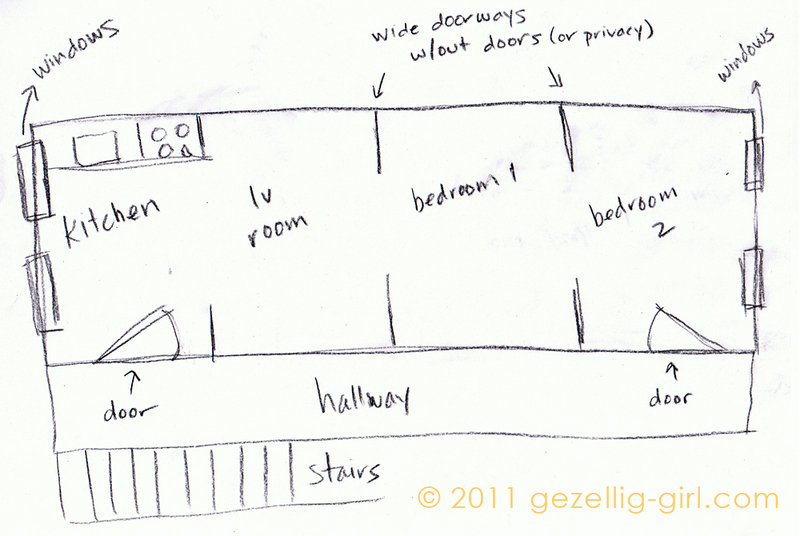 I also neglected to add a bathroom — they’re usually next to, or even in (although walled off from) the kitchen. Apartments like these used to be called cold-water flats. There would have been a bathtub in the kitchen and you would have heated water on the stove to fill it. I should add, I think railroad apartments (in this style I have here) are pretty great for anyone without kids. And, as I said, there are other technically railroad apartments that have better layouts than this: one room that’s off to the side, bedrooms at either end, etc. Interesting. Both of my NY cousins live in Brooklyn and yup, one apartment is long and skinny, though there’s a bedroom next to to kitchen, so there’s that door, and the bathroom is tucked under the stairs, so there’s another door. But the rest of it is wide open. Works well for one person or a couple, but not good for a family, nope. Still, I envy you your search. I used to love looking for apartments!